Our search for the best Japanese ramen in Sydney continues.... This time we try out the recently opened Miyama Japanese Noodle Bar at on George Street\Broadway near Central Station. After eating a few dozen ramens we realised it is specifically tonkotsu ramen we are obsessed with: it's that finely balanced milky textured pork bone broth that sends us into travel-food-nerd heaven. This clip from Japanese TV sums up the wonderous joy of tonkotsu ramen, even without knowing a word of Japanese. Incidently that pretty much sums up free-to-air Japanese TV, or at least what we saw anyway: zany panel shows. Anyway, back to our caper... There's a handful of hole-in-the-wall asian joints recently opened at the very south end of George Street near Central Station, they all look great and demand investigation. Miyama Japanese Noodle Bar caught our eye because their logo has a googie egg on it. If there is one thing we like in our ramen it's a googie. And not just any googie, but a soft boiled googie, or a cackleberry as they call them out west. And Miyama Japanese Noodle Bar delivers. Look at that beautiful soft boiled googie in my ramen, lightly cured in soy. It is such a simple pleasue but surprisingly hard to find in Sydney. And the ramen is good. It was one of the better tonkotsu ramen broths I have had in Sydney, a little short of being a 'magic' ramen moment, but definitely the best value ramen we have found in Sydney at only $8.50, including googie egg. We must admit we have had better noodles, it seems you just can't have everything when it comes to ramen. 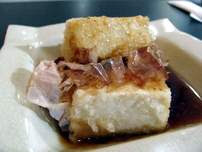 To top it off they do one of our favourite bar snacks, agedashi tofu: silken tofu fried tempura style with bonito flakes (shaved dried fishies) and a soy dressing. Beautifully cooked, droolworthy, and only $3. Miyama Japanese Noodle Bar is in a weird little arcade at Shop 12 855 George Street Sydney, near the corner of Harris Street. Open 11am-10pm daily. There is a new branch open on George near 85C cake shop, the soup seems very flavoursome.